WARNING: Due to the nature of this game, spoilers are unavoidable. Skip to the conclusion if you have any interest in playing Eversion. Eversion runs on a premise that was a common standby in the golden age of arcade games. This is the only piece of context you get going into Eversion. 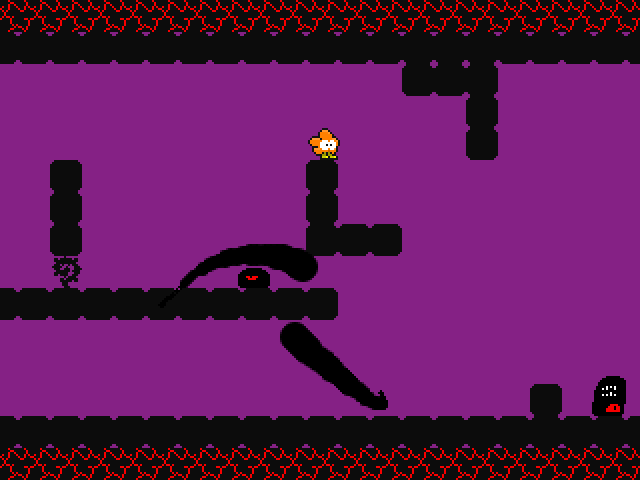 To elaborate, the protagonist of this game is Zee Tee, a flower-like creature based off an asterisk. Princess Nehema has been captured by unknown forces, and it’s up to Zee Tee to rescue her. 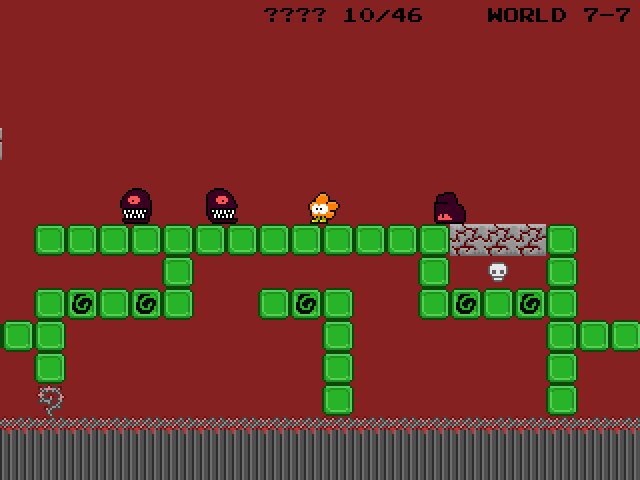 When you begin the experience proper, you’ll discover that Eversion is a platforming game. 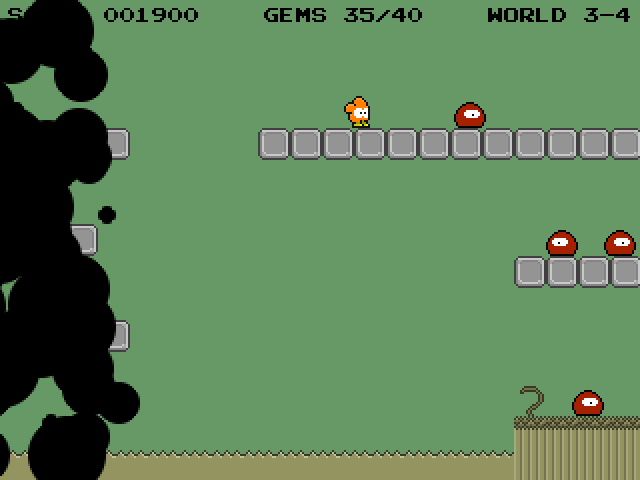 Eversion is not unlike Braid in how it harks back to the colorful 8-bit era, though the visuals of this game are much more simplistic – to the extent that the backgrounds are entirely monochromatic. 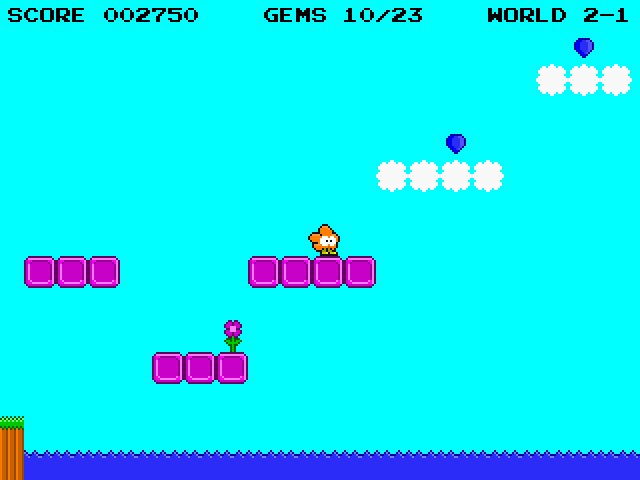 Despite this, you get a sense of how joyful the world of Eversion is with its bright colors, flowers and upbeat music. It is also like Braid insofar that it takes many cues from Super Mario Bros., the game considered ground zero for the 2D platforming genre. By default, you control Zee Tee using the arrow keys. As there is no run function, Zee Tee has two states: moving or not moving. You can make him jump with the “Z” key. This also happens to be his sole means of defense. 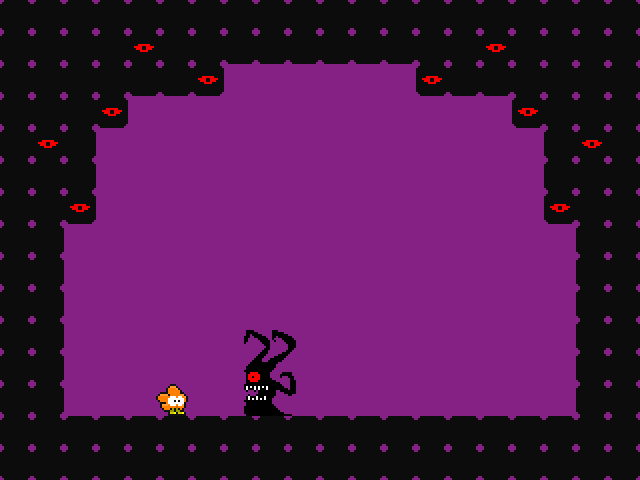 Serendipitously, the only enemies you have to deal with are Ghulibas, which resemble Goombas from the Mario franchise. Despite their overly friendly appearance, they are deadly to the touch. Fortunately, they are as just as easily dispatched; all it takes is a single jump to put them out of commission. By holding down the “Z” key, Zee Tee will gain significant height off the creature’s head. Much like in a given Mario game, this technique is instrumental to reaching higher places. Directly in front of Zee Tee when the game starts is a series of floating bricks and boxes adorned with smiley faces. 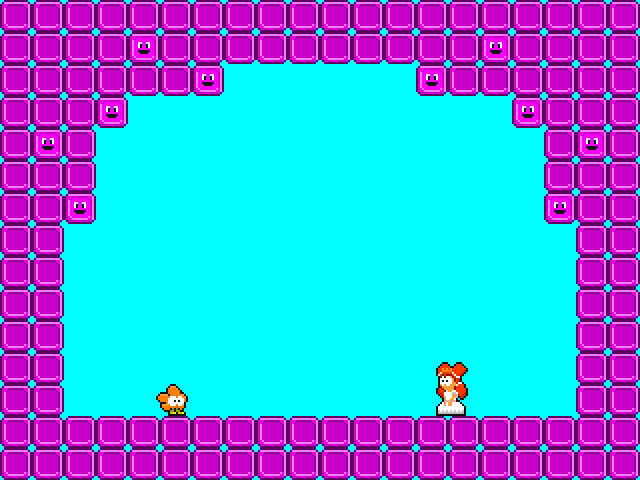 They are arranged in a way that resembles the similar arrangement of bricks and question mark blocks awaiting the title character of Super Mario Bros. There is no power-up system in Eversion, meaning that one successful attack is enough to fell Zee Tee. The game does, however, feature plenty of gems. Some are out in the open while others are only uncovered by jumping into a face block from below. Though obtained in a similar manner as coins in Super Mario Bros., the exact function of gems is not clear from the onset. After all, in Super Mario Bros., players diligent enough to collect one-hundred coins would be awarded with an extra life. This would appear rather redundant in Eversion given that no life system exists; you are allotted infinite chances to complete the game. On top of this, gems differ from coins in that they remain collected even if you die. This means you don’t have to worry about collecting the gems and clearing the stage in a single run. 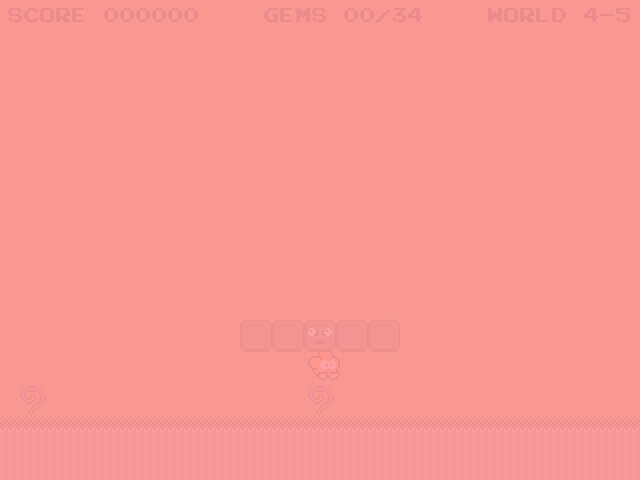 As you traverse the first stage, you may notice something a little peculiar about how the gems are placed. There appear to be a few of them precariously placed above a set of clouds. This would appear to be a glaring oversight in light of how the clouds are not solid. This wasn’t an accident, but because it’s possible to clear the stage without collecting all of the gems, a newcomer may be inclined to simply make a mad dash for the exit. 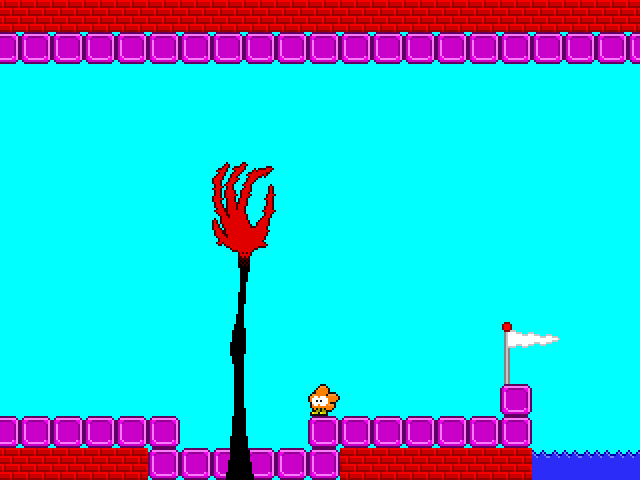 In true Mario fashion, the end of the stage is marked with a white flag, though Zee Tee doesn’t slide down a flagpole, sadly. If a player familiar with Super Mario Bros. was expecting a similar naming convention for the stages in Eversion, they may be taken aback when they see the words “World 2-1” adorn the top-right corner of the screen. It seems a bit strange that the game would skip over an entire world. Why not just label the first stage “World 1”? 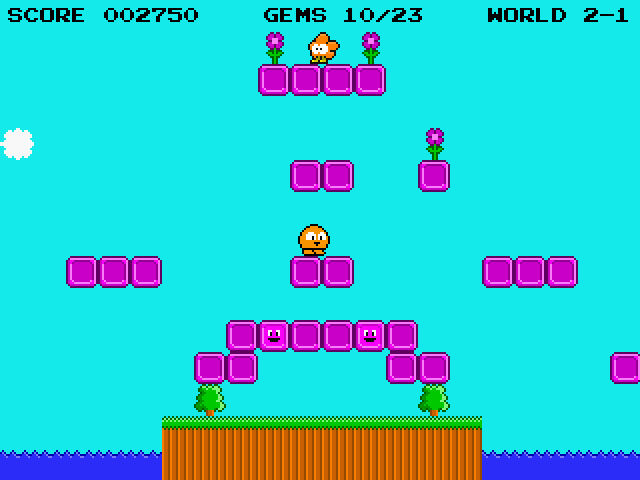 Either way, the game’s second stage has Zee Tee navigating platforms over large expanses water. Everything goes smoothly until the player reaches the halfway point. Suddenly, what was once a minor problem has turned into an issue the player must directly address. How can Zee Tee possibly jump onto clouds? It has already been established that they’re not like certain clouds in the Mario franchise, which are indeed platforms. This is where you must make the name of the game become relevant. “Eversion” comes from the verb “Evert” – the process of turning inside-out. Its most common usage is to denote the anatomical term of moving the sole of one’s foot away from the median plane. In mathematics, it describes the process of turning a shape inside-out without causing creases – typically in sphere eversion. It can even refer to the curious defense mechanism possessed by sea cucumbers wherein they eject their internal organs in an attempt to tangle and frighten their would-be predator. It should be noted that the process of everting in Eversion doesn’t produce as gruesome of a result as the scenario involving sea cucumbers. Instead, Zee Tee has the odd ability to turn reality itself inside out. The title screen made a reference to the “evert button”. By default, this is the “X” key. However, Zee Tee cannot use this power without restriction. Only in certain parts of a given stage is this option available to him. This too presents a problem, for no such part seems to exist. They actually do exist – they’re just not marked with any kind of visual clue. A piece of text that appears before the title screen quotes a famous and highly influential author. 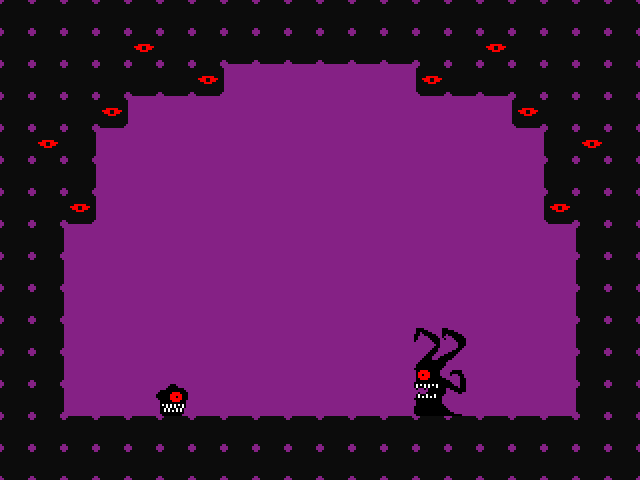 As Zee Tee approaches a certain section of the stage, the background will change colors and a faint tune independent of the default background music begins playing. This is where you must evert. In this new reality, everything looks quite different. The faces on the blocks, though still happy, seem a little less cheerful. Similarly, the Ghulibas are pacing around at a slower rate with neutral expressions on their faces. 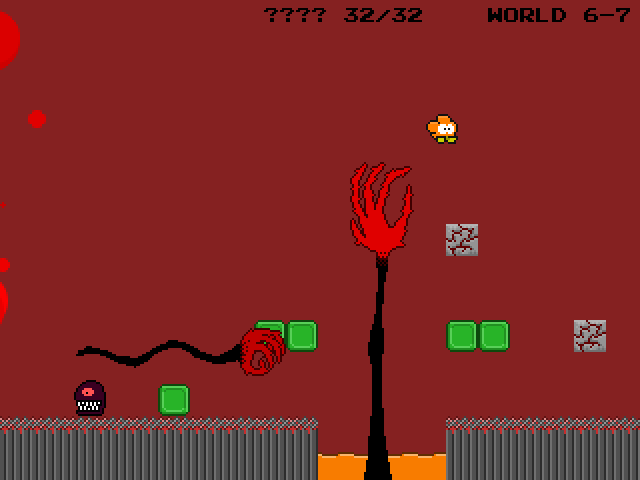 More importantly, the clouds are now solid platforms, allowing Zee Tee to reach the end of the stage. 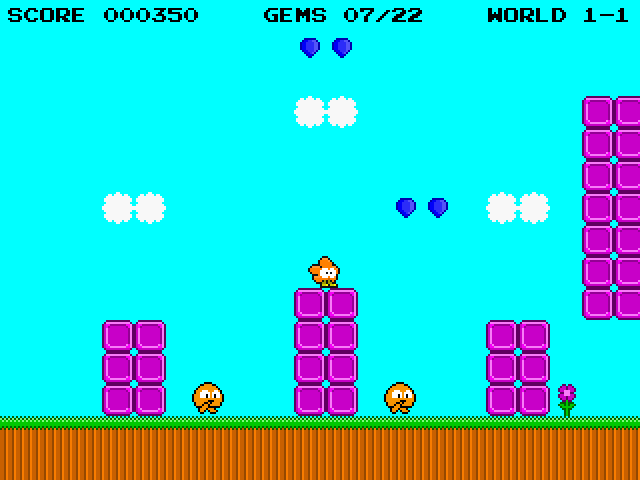 Although the stages of Eversion are named in a similar fashion to those of Super Mario Bros., there are only eight stages. The first digit is the actual number of the stage while the second designates the plane of reality on which Zee Tee resides. Because of this, the layers are often labeled “X-1”, “X-2”, and so forth. Every plane has distinct properties to them that extend beyond the visuals. Layers X-1 and X-2 have many noticeable differences, and a thorough examination of the second stage reveals an eversion point leading to X-3. This reality is much more subdued with a washed-out color palate, wilted vegetation, slow-moving enemies, and melancholic music. 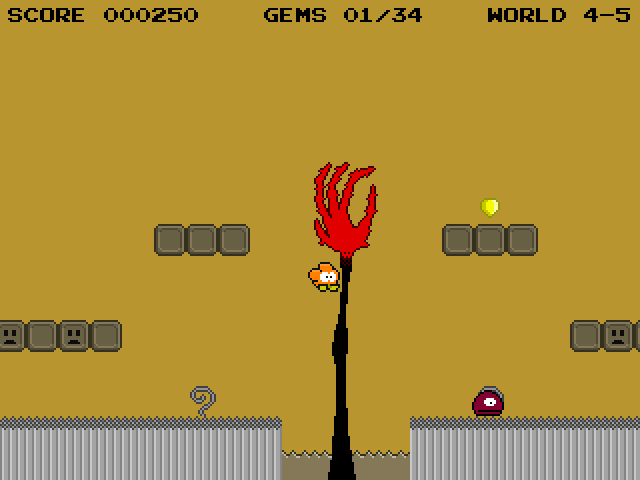 Notably, this allows Zee Tee to pass the trees that were blocking his path to the last few gems in the stage. From playing these first two stages, the player will learn the importance of everting. Indeed, navigating these stages will require a mastery of the mechanic. You must take note of the subtle differences between each layer in order to reach the end of a given stage. 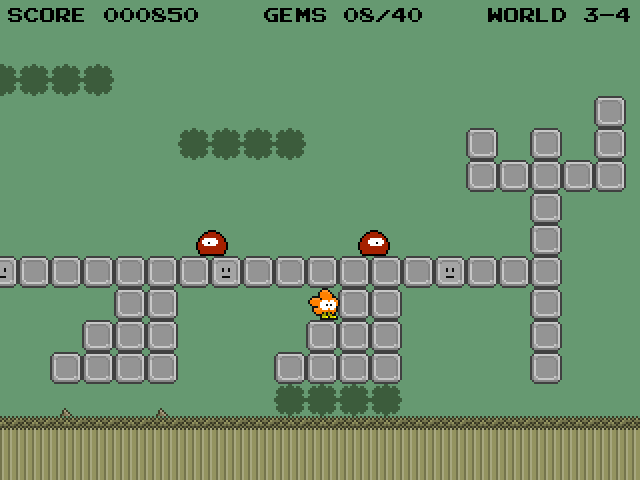 In this respect, Eversion is quite similar to A Link to the Past or Oracle of Ages – both of which featured a dual-world mechanic that relied on players catching onto small details to solve puzzles or just to get from Point A to Point B. Bearing this in mind, it is in the next stage that you begin to realize Eversion may not be what it appeared to be. That exact moment occurs when you reach X-4 for the first time. With its demented music, frozen enemies, and dull colors, this layer appears to be completely lifeless. Notably, this is the only layer so far in which both clouds and trees can be passed through, effectively fusing the unique properties of X-1 and X-3 together. You get the sense that the world is falling apart at the seams, which is complemented by how the bricks can now be broken by hitting them from below. This is arguably where Eversion shines the most. It takes mechanics savvy players are familiar with, whether it’s breaking bricks or traversing multiple realities, and goes many interesting routes when it comes to justifying them. Just in case you were becoming complacent in this lifeless world, you will be given a rude wake-up call in the form of a black, formless mass that appears around the halfway point. It cannot be defeated by any means, so Zee Tee’s only recourse is to run as fast as he can. After a harrowing escape, the next stage begins in the cheerful X-1. It seems fitting that such a tense moment be followed up with a relaxing stage. Unfortunately for the player, things are only going to get worse from here. How can you tell things have reached a tipping point? The answer is simple. It’s when you strike the face block at the beginning of the stage only to knock its eyeballs loose, transporting Zee-Tee to layer X-5. In a bit of an ironic twist, X-5 is a much livelier place than X-4. In the previous layer, everything seemed to be dead. X-5, on the other hand, appears to be a scene out of hell itself. The now one-eyed Ghulibas have adapted to their lack of legs by learning to slither like snakes. Just in case you thought X-5 isn’t that much worse, your feelings of confidence will be dashed the second you attempt to jump over a pool of muddy water. In doing so, a giant, demonic hand pops out of the water out of nowhere and tries to kill Zee Tee. This single moment has caused many players to reel back in shock. In a majority of these cases, I could tell they would have made the jump had it not been for the noise accompanied with this hands’ sudden appearance. This is because you can see Zee Tee suddenly stop in midair as the hand appears, thus ensuring his demise. This is the single most impactful stage in the game. It makes it difficult to believe how a game that seemed to model itself after the Kirby franchise could make the player paranoid simply jumping over bodies of water – something they had doubtlessly done countless times. Now that the player has been fully inducted into this game, the world of Eversion has no qualms about presenting its once-hidden malevolence. From the sixth layer onwards, the Ghulibas bare their sharp fangs, the faces on the blocks are disfigured as though melting, and bricks now crumble when stepped on. Furthermore, while Zee Tee or the Ghulibas would merely fall offscreen when dead, these realities have them explode in a torrent of blood. 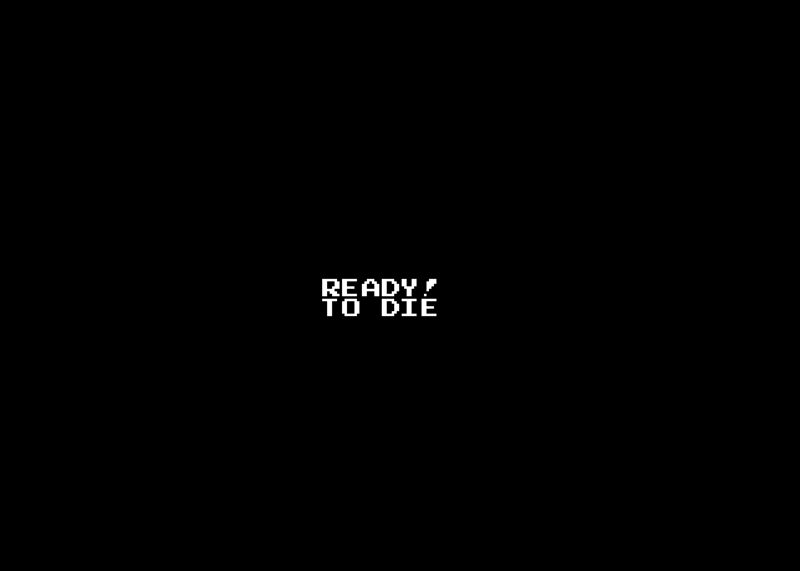 Even the interface itself seems infected by these realities, for the score counter begins displaying random numbers and every time you die, you could see a different message awaiting you other than the familiar “READY!”, including this greatly appreciated homage to a classic 1994 album. It was easy for players to dismiss the aforementioned quote by renowned horror writer H.P. Lovecraft as an ironic juxtaposition, when it turns out it was highly fitting. In fact, Eversion was entered into Commonplace Book competition in which it ranked third. 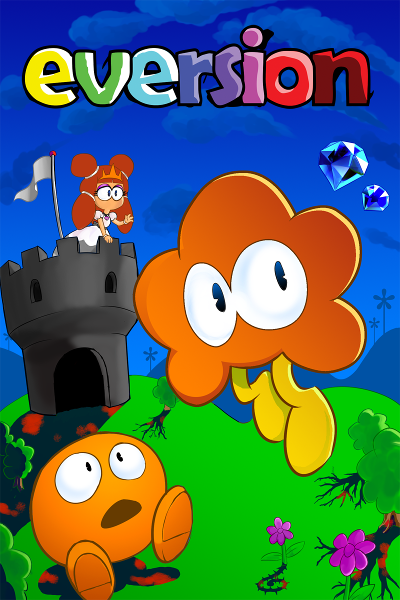 Likely owing to how it initially presents itself as a dime-a-dozen cutesy platformer, it gained a following that overshadowed the contest’s winner, Verge. As novel as the idea of everting worlds is, I have to comment that it’s something of a double-edged sword. There was a reason why A Link to the Past and Oracle of Ages only had the protagonist traverse two worlds. This is because with two worlds to create, the developers had few difficulties adding as many details as possible. In doing so, they lent both worlds a lot of personality that complemented each other in many unexpected ways. The team behind Eversion ended up crafting too many realities. While there are substantial differences between the first few layers from the decaying bricks to the flora becoming deadly to the touch, the remaining ones are just increasingly grotesque versions of the one that preceded it. It is unsettling watching the enemies become more demonic with each level and the sixth stage does appropriately hit home exactly how dangerous the once-colorful world has become. A second formless mass apparently made of blood begins chasing Zee Tee, launching demonic hands of its own. While this does lend the stage a feeling of oppression, it does reveal another glaring problem with the experience. That is to say, the controls aren’t exactly polished. Even a veteran player will find themselves dying quite often to the Ghulibas or the demon hands. I feel this stems from the fact that Zee Tee doesn’t really gain momentum the same way Mario does, which itself could be explained by the lack of a run button. When your character only has one mobile speed, it is often difficult to negotiate jumps with any degree of skill, turning the game into a prolonged trial-and-error affair. The game isn’t terribly long, but having to perform the same jump several times in a row until you get it exactly right makes for a tedious experience. The seventh stage differs from the preceding six in that there are no forced eversions. In fact, you can simply march straight to the end of the stage without any problems whatsoever. It even allows Zee Tee to reunite with the princess. For good measure, the game automatically closes itself after this enlightening revelation. Because this would be an exceptionally sour note on which to end the game, a newcomer might express gratitude that there is another ending awaiting the persistent. As it turns out, the gems littering the stages aren’t as optional as one would think. Even if it took the game time to get there, I must say the eversion mechanic was implemented to a wonderful effect in the seventh stage. 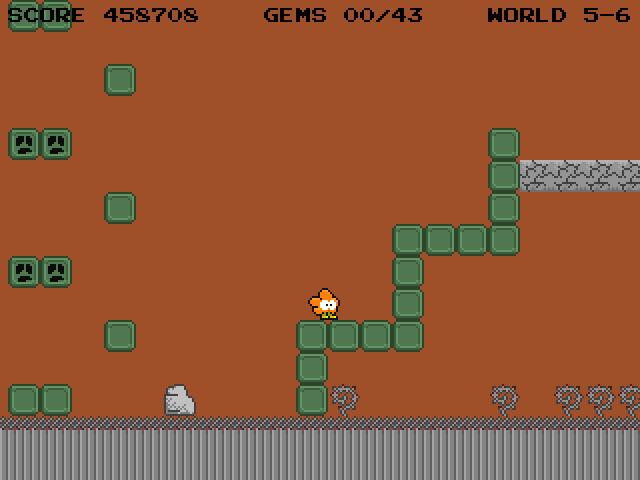 All of the layers can be visited in this stage, and it is through taking advantage of the subtle differences between them that you can obtain all of the gems. 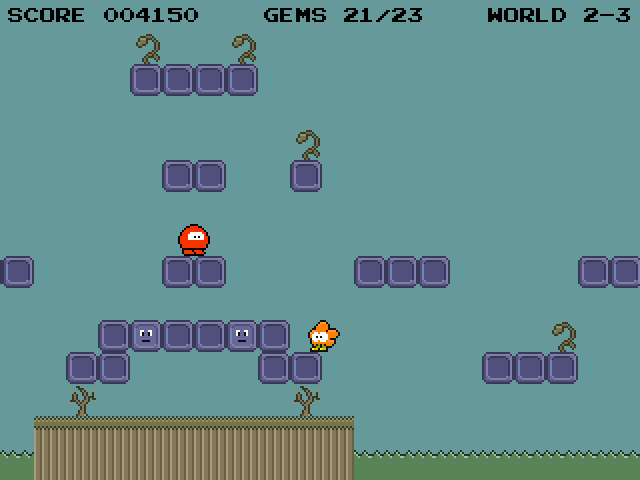 As the above screenshot indicates, you can have Zee Tee run across the cracked bricks and then come back in World 7-1 to hit the face blocks, so you can collect the gems. I really enjoy how this plays out in the game. 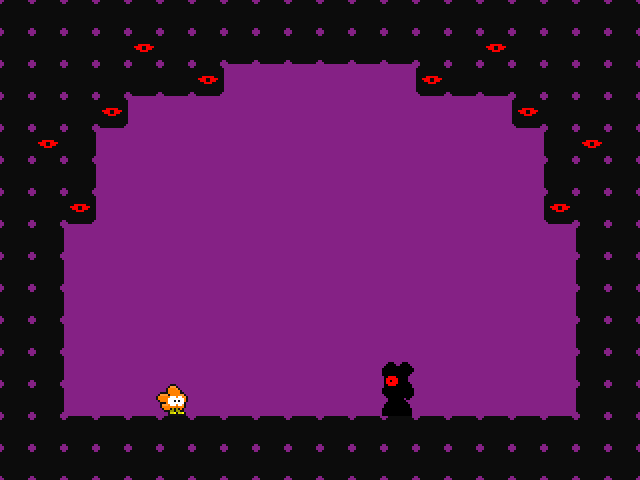 World X-1 is the one in which the game begins, yet you’ve spent such a long time in darkness that when you finally return to it, your eyes will likely need a few seconds to adjust. It shows how gradual the eversion process manages to be when you realize even World X-2 isn’t as bright. Once you have obtained all of the gems, it may be tempting to run to the flag, but this will only trigger the bad ending a second time. What you must instead do is return to the gem counter at the beginning of the stage. As the flash of colors and the eerie music indicate, there is one more layer for Zee Tee to explore. This reality is utterly devoid of light, and the now-swift Ghulibas are now effectively immortal, being able to fully regenerate after a few seconds of being attacked. The most notable change is that there is now a castle awaiting Zee Tee at the end of the stage. The final stage of Eversion depends on the version you’re playing. In its original release, Zee Tee is made to navigate a stage while randomly teleporting between different realities. This was a highly annoying gimmick because it left your chances of advancing up to chance. One segment requires you to wait until you end up on a layer in which the bricks can be broken from below, yet can be safely walked on. Because there are only two layers that allow this, X-4 and X-5, you had a two in seven chance of being able to proceed with the game. If you ended up on the wrong layer, you had to wait around five seconds before the game decided to let you pass. Depending on your luck, it could take anywhere between one to five minutes to complete, making it a nightmare for speedrunners. The good news is that this stage was eventually excised in favor of one which uses the eversion mechanic far more effectively. What you must do is progressively evert backwards. If you simply run forward, the stage will repeat. 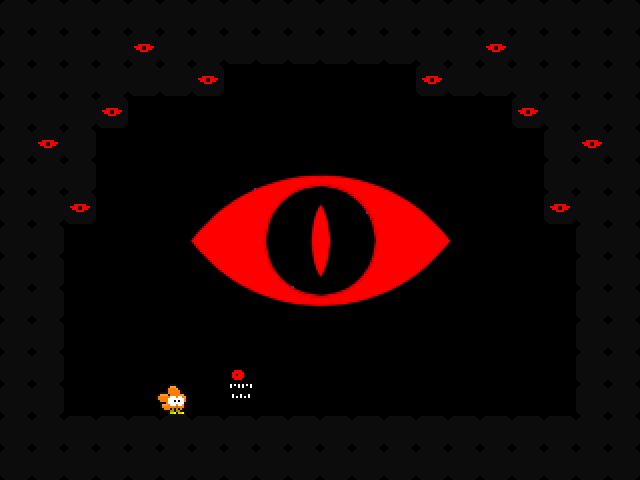 Every layer has two unique rooms, and by everting to a previous one, you will be silently warped to a new room until you reach the goal in World 8-1. This stage is fun to play through simply to see how many paths and eversion points there are. Just to remind Zee Tee of the hell he went through, the game throws one last demonic hand at him. It’s difficult to die from it, but this was a well-executed jump scare in how it plays with the rules firmly established by the rest of the game. Other than that, there is nothing stopping Zee Tee from touching the flag at the end of the stage, thereby allowing his journey to come to an end. The princess is safe at last. I find it highly fitting that Eversion and Braid were released in the same year because both games are similar from a thematic standpoint. They are both games that took a firmly established genre and twisted it until it became nearly unrecognizable. On top of this, they both operate on concepts that encourage players to formulate their own theories. In this regard, I have to say that Eversion manages to succeed to a far greater degree than Braid. Jonathan Blow’s debut effort threw random and often nonsensical pieces symbolism at the wall that did not make any sense until it was literally spelled out for you. Even then, said symbolism wasn’t made relevant until the final stage. Eversion doesn’t fall into this trap; the theories fans formulate about it are more interesting to read because they parse the experience as a whole. It’s a fascinating case study of what one can accomplish with the visuals alone. Unfortunately, while Eversion makes for a great conversation piece, I have to admit that Braid is a better overall game. This is because Braid ultimately gets more mileage out of its central concept whereas Eversion equivocates for a significant portion of the experience, content to throw its style in your face before doing anything substantial with it. It’s a shame because when Eversion is good, it succeeds in ways few other works could grasp. Many people when crafting these kinds of works are overly eager to hit their audience over the head with their concepts. Mr. Töws actually lets the experience settle by gradually drawing players in, which makes it all the more memorable. Though I cannot dub it an essential experience, I do think it could be worth looking into. If you are interested in playing this game, do not read anything about it and refrain from watching the trailer of the HD rerelease, as the most affecting moments will be spoiled. 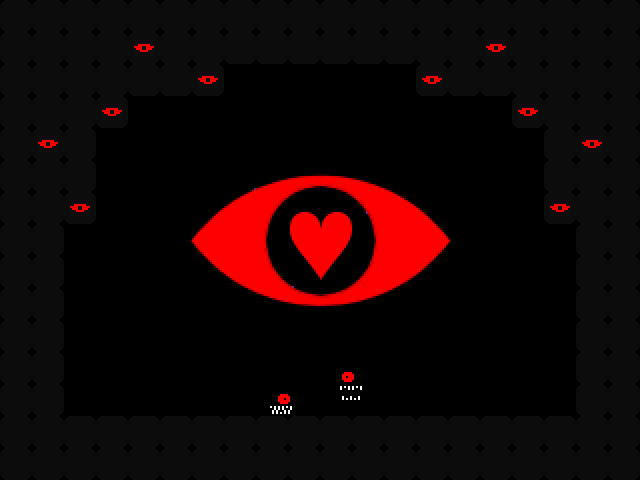 Though simplistic in its execution, I feel Eversion represents the primordial aspects that would make indie game storytelling so memorable throughout the 2010s. I have a soft sport for games/anime that initially look cute only to then take a dark turn later. This sounds like a creative little game. 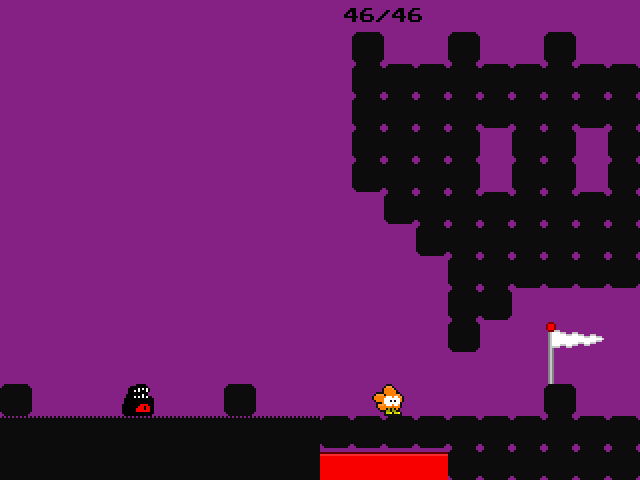 It’s easy to forgive the controls and length, as it is freeware. If you like those kinds of games, this one will be right up your alley. The subverted innocence thing may be done to death, but when it’s effective, it can make for a memorable experience, and Eversion is a well-done example of that. There is a $5 HD version, but the freeware version can still be found with enough Googling. 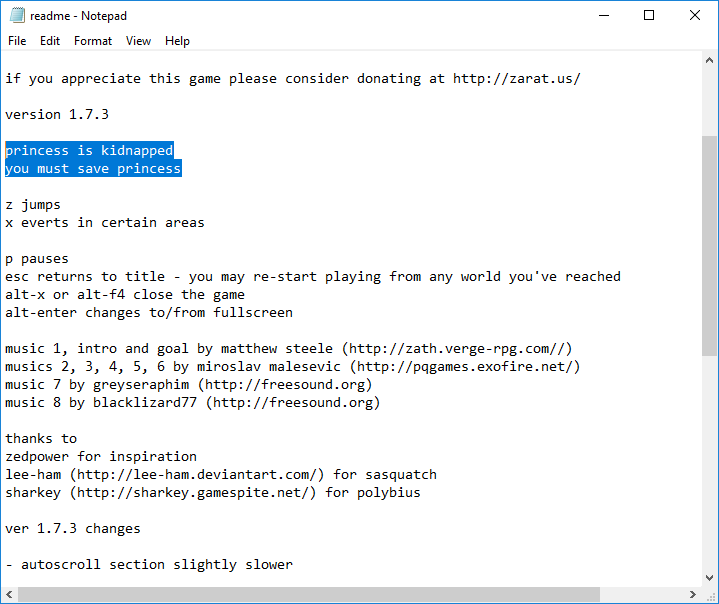 I’ve got a big admiration for creators that release their work as freeware. Like, they had an idea, thought the world would be a better place with this idea in there, and released it in as pure a form as possible. That’s a world I like living in. Unfortunately, not all freeware things are great, but Eversion sounds like it’s been an interesting concept explored, at least. I do as well. That’s what Matt Thorson was doing before he hit it big with Celeste. 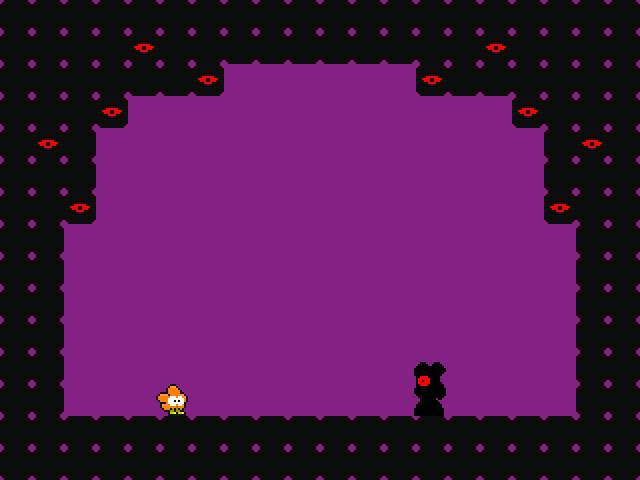 Even if they were basic platforming games, Jumper and Dim were quite addictive. This was the kind of ethos that led the indie scene to where it is now. Eversion had an interesting idea and executed it fairly well, yet didn’t really have much to offer outside of that. Still, I think it’s neat enough that checking it out blind would make for quite the memorable experience.